Since we can’t do much about the new 2007 Honda CR-V‘s quirky D pillar and it’s smiley grille at the front end, we might as well deck it out in some nice kits to see if it does the SUV some good. 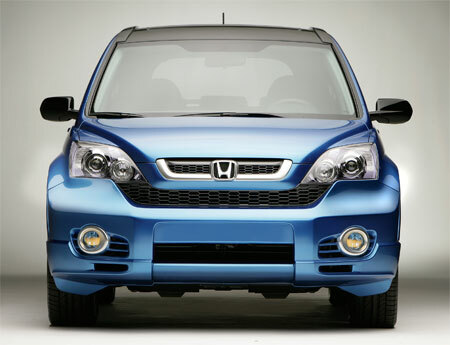 Painted in a color called Agile Blue, the Sport Concept CR-V shown at the 2006 SEMA Show features new front and rear bumpers along with a sports suspension which also gives the CR-V a lower ride. Wheel arches are filled up with 19 inch wheels wrapped with 245/45/R19 Bridgestone Potenza tyres. 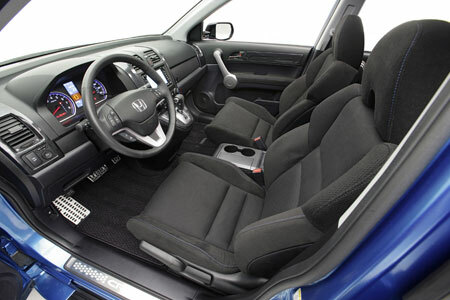 On the interior, you get new sports fabric seats with blue custom stitching, with the same stitching on the steering wheel and shift knob to match. 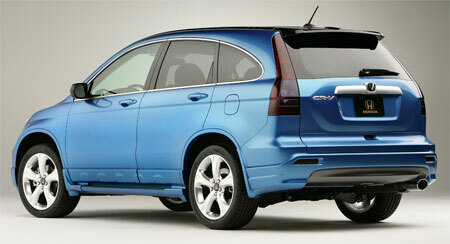 Is the new 2007 Honda CR-V’s design growing on you yet?